Travel west along Shute Harbour Road for about 10 km and turn left onto Brandy Creek Road. Follow this road onto Forestry Road through to the car park. This is the start of the Conway circuit. One kilometre north of Proserpine (or 65 km south of Bowen), turn off the highway onto Shute Harbour Road. Travel 12 km before turning right onto Brandy Creek Road. Follow this road, and then Forestry Road through to the car park. Find the comprehensive circuit map here. 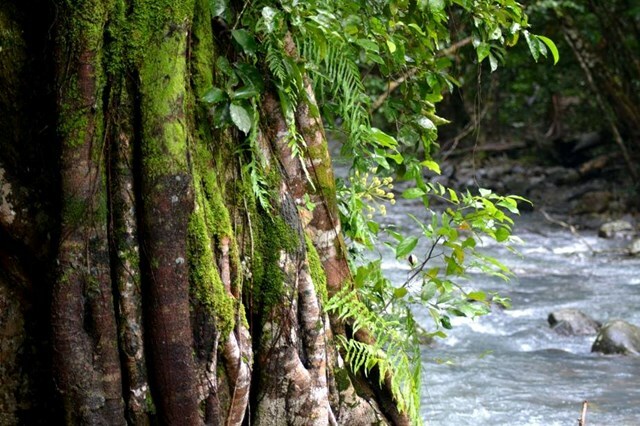 Highlights of the Conway Circuit include wandering through majestic tropical rainforest, relaxing by seasonal creeks and looking beyond coastal townships to the Whitsunday islands. Tantalise all of your senses by looking for the blue flash of a Ulysses butterfly, smell lemon myrtle flowers and listen for the distinctive call of the Wompoo Fruit-Dove. With tracks of varying distance and difficulty, everyone can explore the Conway Range. 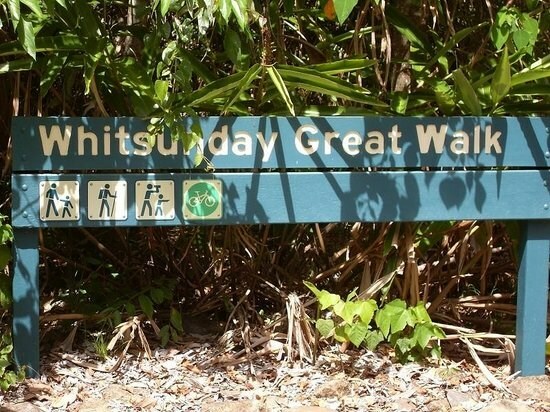 The entire Great Walk is intended to be a three day escape but you can choose shorter walks that are linked to the main track, accessible from Brandy Creek or watch out for the annual ‘Run the Whitsunday Great Trail’ event. 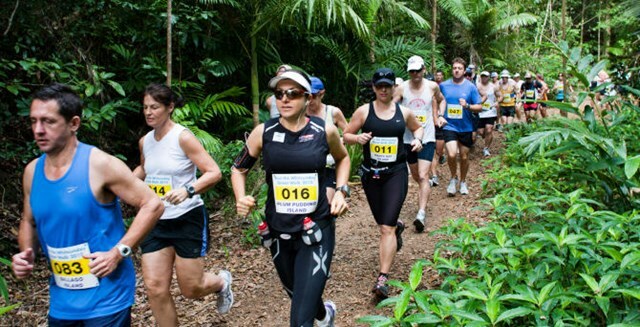 For a shorter walk, start the trail from Kara Crescent in Airlie Beach. After approximately 1 hour, you will get to Honeyeater track junction. Take a right turn which will take you on a 1.5 hour return track to a lookout offering magnificent views over Cannonvale, Dryander Range, the Whitsunday Islands and beyond. Kingfisher Circuit and Wompoo Walk are also shorter walks that are part of the Conway Circuit, both are accessed from the Forestry Road car park. Walking: 3 days and 2 nights is recommended, however can be done in under 6 hours. For those looking to get amongst nature and sleep under the stars, the National Parks of the Whitsundays offer a variety of designated camping spots for you to enjoy the serenity (permits required). Discover some of the ‘off the beaten’ track hidden gems of the Whitsunday Coast, from picturesque views and spectacular waterfalls to the flora and fauna of the rainforest. Camping fees are applicable if camping. However, not all of the trails require camping. $3.30 per person per night for students and accompanying adults on approved educational excursions. Find more info on the Department of National Parks, Sports and Racing's site here. Beautiful walk in the Conway National Park. You can do the whole circuit in a day or varying lengths at each end with a 2 hour to half day length. Transport or a transfer is required to reach the trail head at the brandy creek road end of the trail. Only did honeyeater lookout track but couldn't find the walk on here to tick! Well. I came across a backpacker who was a bit frustrated by the length of this track. Although it is about 3.6km round circuit, it certainly feels longer. There are several inclines and the track winds down and around regularly. You feel like you're going up and down in vain. Nevertheless the views are amazing and second to none. I saw one snake on the track but there'd be plenty more around haha. Also quite a few goannas and some gorgeous butterflies! Overall I'd recommend this track but be prepared for the humidity. A snake bandage be a good idea too. 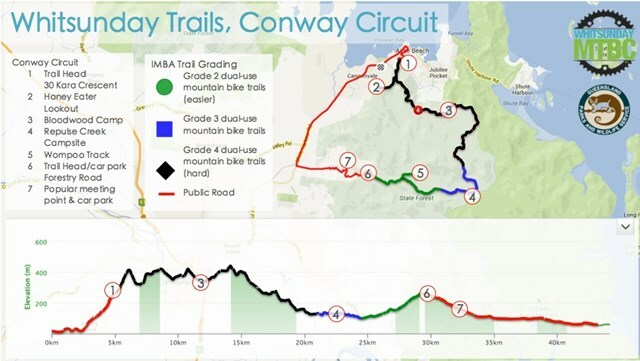 Conway Circuit - Grade 4 - 27 KM One Way. Completed the whole circuit in one day. 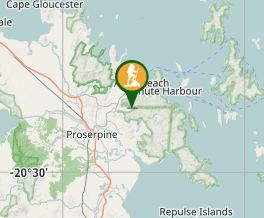 We started at Brandy Creek and finished at Kara Crescent in Airlie Beach. We started hiking at 5:30 AM to 3:30 PM. There were plenty of wild boars,goannas and leeches(though it rained a couple of days before the hike). The trail is marked almost every kilometer. A few steep sections between 10km to 16 km mark and between the last 3.3kms. Overall it was good fun! Did complete the whole circuit (27.1km) but don't remember how long it took. We started early morning and finished early afternoon. The last segment of the walk is especially difficult, being quite steep in terrain. However, there are shorter walks (such as Wompoo, or to the first camp) that are a lot easier for everybody to attempt. Beautiful scenery and constant bird calls being heard. My dad and I did this track (him with a 20kg pack) while he was training for Kokoda and found it incredibly helpful.